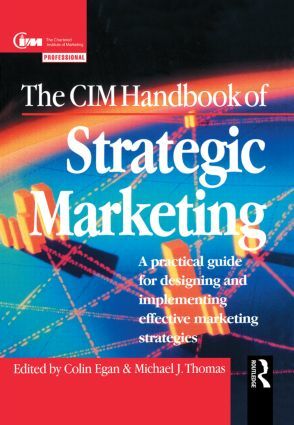 The CIM Handbook of Strategic Marketing targets senior executives responsible for shaping and managing the company's strategic direction. The strategic dimensions of marketing management are emphasised along with the critical importance of matching the company's capabilities with genuinely attractive market sectors. The Handbook's strategic perspective and pragmatic outlook pervade the text and underpin its practical foundations. The rise of global competition and continuous innovation have redefined market structures, reshaped industries and given customers unprecedented value and choice. In this era of customer sovereignty there is a tremendous amount of pressure on organizations to adopt the principles of the marketing concept and to develop a much sharper strategic focus. The book amounts to a firm blueprint written by leading marketing thinkers for designing and implementing effective marketing strategies and improving business performance. Colin Egan is Professor of Strategic Management at Leicester Business School. Michael J Thomas is Professor of Marketing at the University of Strathclyde Business School. Market dynamics and marketing strategies by Professor Colin Egan, Leicester Business School; A strategic perspective on the marketing mix by Professor David Jobber, University of Bradford Management Centre; Marketing strategies for growth, maturity and decline by Professor David Shipley, Trinity College, University of Dublin; Innovation strategies for competitive success by Professor Colin Egan, Leicester Business School and Dr Veronica Wong, Warwick Business School, University of Warwick; Strategies in the end game by Professor Peter McKiernan; Exploring the principles of market segmentation by Dr David Tonks, The Management School, The University of Lancaster; Competitive positioning by Professor Graham Hooley, Aston University Business School; Market-driven strategic planning by Professor Malcolm McDonald, Cranfield School of Management; Developing an effective brand strategy by Professor Leslie de Chernatony, The Open Business School; Strategic marketing networks by Professor Martin Christopher, Cranfield School of Management; The challenges of global marketing by Dr John Fahy, Trinity College, University of Dublin; Evaluating stakeholder principles in strategic marketing management by Professor Colin Egan, Leicester Business School and Professor Gordon Greenley, Aston University Business School; Implementing marketing strategies by Professor Nigel Piercy, Cardiff Business School, University of Wales; Looking to the future: marketing in the twenty-first century by Professor Peter Doyle, Warwick Business School, University of Warwick; A strategic view of the future of the marketing profession by Professor Michael J Thomas, University of Strathclyde.